NK cells are an important component of host immune defense against malignancy and infection. NK cells are educated by MHC class I ligands to ensure self-tolerance while also promoting lytic competency against altered self and damaged self targets. However, the intracellular molecular events that culminate in tolerance and functional competency of educated NK cells remain undefined. Mice with germline deficiency in SHIP1 were shown to have a defective NK cell compartment. However, SHIP1 is expressed in all hematopoietic lineages, and consequently several hematolymphoid phenotypes have already been identified in certain cell types that are the result of SHIP1 deficiency in cells in separate and distinct lineages, that is, cell-extrinsic phenotypes. Thus, it was previously impossible to determine the NK cell–intrinsic role of SHIP1. In the present study, through the creation of an NK cell–specific deletion mouse model of SHIP1, we show that SHIP1 plays a profound NK lineage–intrinsic role in NK cell homeostasis, development, education, and cytokine production. Moreover, we show SHIP1 expression by NK cells is required for in vivo–mismatched bone marrow allograft rejection as well as for NK memory responses to hapten. Natural killer cells are an innate lymphocyte that through production of cytokines and direct target cell lysis are important in host defense against viral infection and malignancy (1). At a cellular level, NK cell activation is regulated by the balance of signaling from germline-encoded activating and inhibitory receptors (2). Activating receptors recognize endogenous danger molecules and pathogen-encoded ligands, whereas inhibitory receptors recognize self-molecules such as MHC class I (MHC-I) (2). To prevent autoreactivity, NK cells undergo an education process that prevents activation of an NK cell that lacks expression of an inhibitory receptor capable of MHC-I recognition. Inhibitory receptor binding of self MHC-I ligands is thought to endow NK cells with functional competency, which is considered arming or licensing (3, 4). Others have proposed that NK cells that fail to express MHC-I–binding inhibitory receptors experience chronic activation and thus become disarmed (5). Moreover, there is evidence that both arming and disarming could regulate NK cells in distinct processes (6). The molecular features of both arming and disarming remain uncharacterized. Thus, although a great deal has been learned about the receptors and ligands that determine the regulation of NK cell activation and education, there is a significant deficit in our understanding of the intracellular events that culminate in NK cell education, licensing, and disarming. NK cells have recently been shown to possess memory capacity to a range of stimuli, including memory responses to CMV (7), haptens (8), and viral particles (9). The NK cells responsible for the memory response to haptens and viral particles reside in the liver and are not renewed from adult hematopoietic stem cells in the bone marrow (BM) (10). This liver memory NK cell population appears to be a unique lineage of NK cells that express CXCR6 (9), Thy1.2, and Ly49C/I (8) but are DX5−CD49a+ (10). NK cell memory to murine CMV (mCMV) infection is mediated by a Ly49H+ splenic NK subset that requires the transcription factor Zbtb32 to regulate their mCMV-induced proliferation. Intriguingly, Zbtb32 is not required for maintenance of the hapten-specific memory NK cell subset (11). Additionally, signaling through DNAM-1 and STAT4 is required for the generation of NK cell memory to mCMV (12, 13). However, the role of these molecules in hapten and viral particle–associated NK memory has not been examined. Mice with germline deficiency in SHIP1 have a severely defective NK cell compartment (reviewed in Ref. 14). NK cells from these mice have a skewed NK cell receptor repertoire (NKRR) (15, 16), decreased IFN-γ production following activation (16), decreased killing of tumor targets (17), and an inability to reject MHC-I–mismatched BM allografts (15, 18). However, whereas SHIP1 appears to be required for natural cytotoxicity and IFN-γ production in mice, SHIP1 may limit Ab-dependent cellular cytotoxicity, at least in human NK cells (19, 20). It is presently unclear whether NK cell defects in SHIP1-deficient mice are due to an intrinsic role of SHIP1 in NK cells or whether the NK cell phenotype is due to the inflammatory cytokine milieu present in these mice (these mice develop a Crohn’s disease–like phenotype and succumb to pneumonia typically by 8 wk of life) (21, 22) or a requirement for SHIP1 expression in trans, as SHIP1 expression is also required for the proper function of T cells (22⇓–24), B cells (25), regulatory T cell formation and homeostasis (26), dendritic cell function (27), myeloid-derived suppressor cell homeostasis (27, 28), megakaryocyte progenitor cell formation (29), M2 macrophage homeostasis (30), basophil degranulation (31), hematopoietic niche cell function (32), and mesenchymal stem cell fate determination (33). To assess the intrinsic role of SHIP1 in NK cells, we created an NK cell conditional knockout of SHIP1. In the present study, we show that SHIP1 plays a prominent and lineage-intrinsic role in NK cell development, limiting acquisition of most MHC-I inhibitory receptors, cytokine production, NK cell hapten-specific memory, NK cell education, and acute BM allograft rejection. SHIPflox/flox mice express normal levels of SHIP, but the SHIP proximal promoter and first exon are flanked by loxP recombination signals (floxed) such that SHIP expression is ablated when Cre recombinase is expressed in the cell. SHIPflox/flox mice were originally created on a 129/Sv genetic background and have been backcrossed to C57BL/6 mice 11 times, resulting in mice that are >99.9% C57BL/6 (15). NKp46iCre/+ transgenic mice have been previously described (33). Genotyping of Cre transgenic mice was performed by PCR using primers detecting the Cre sequence (P1, 5′-GGAACTGAAGGCAACTCCTG-3′; P2, 5′-CCCTAGGAATGCTCGTCAAG-3′; P1, 5′-TTCCCGGCAACATAAAATAAA-3′). All animal experiments were approved by the State University of New York Upstate Medical University Institutional Animal Care and Use Committees. Six-well plates were coated overnight at 4°C with Ab, anti-NK1.1 (PK136), anti-NKp46 (29A1.4), or anti-NKG2D (A10) (eBioscience, San Diego, CA). After mice were sacrificed by CO2 toxicity, splenocytes were harvested and RBCs lysed using ACK lysis buffer (eBioscience). Cells (6 × 106) were incubated either in an Ab-coated, unstimulated, or PMA and ionomycin–treated well for 5 h in the presence of GolgiPlug (BD Biosciences, San Diego, CA). Following incubation, Fc receptors were blocked with anti-CD16/CD32 (2.4G2) Ab (BD Biosciences, San Diego, CA). Invitrogen fixable Aqua Live/Dead stain was used according to the manufacturer’s instructions for dead cell exclusion. NK1.1 (PK136) (for all stimulation conditions other than samples stimulated with anti-NK1.1 Ab) or NKp46 (for samples stimulated with anti-NK1.1 Ab) and CD3ε (145-2C11) surface markers were stained (eBioscience). Cells were fixed and permeabilized using a BD Cytofix/Cytoperm kit (BD Biosciences) according to the manufacturer’s instructions. Fc receptors were blocked with anti-CD16/CD32 (2.4G2) Ab. Intracellular staining was performed using an anti–IFN-γ (XMG1.2) Ab (eBioscience). Cells were analyzed using a BD LSRFortessa cell analyzer (BD Biosciences). NKp46iCre/+SHIP1flox/flox and SHIP1flox/flox control mice were irradiated twice, 3–4 h apart, receiving 550 rad both times (RS2000; Rad Source Technologies, Suwanee, GA). Then, 2 × 106 congenic B6.SJL and 2 × 106 MHC-I–mismatched BALB/C (Taconic Biosciences, Hudson, NY) BM cells were injected into the retro-orbital sinus of each host. Seven days later mice were bled and RBCs were lysed using ACK lysis buffer (eBioscience). Fc receptors were blocked with anti-CD16/CD32 (2.4G2) Ab (BD Biosciences). CD45.1 (A20), CD45.2 (104), and H2Dd (34-2-12) surface markers were stained (BD Biosciences). Cells were stained with DAPI for dead cell exclusion. Cells were analyzed using a BD LSRFortessa cell analyzer (BD Biosciences). NKp46iCre/+SHIP1flox/flox and SHIP1flox/flox control mice were sacrificed by CO2 toxicity, and splenocytes or hepatocytes were harvested. In the case of experiments using hepatocytes, blood was flushed from the liver by ligation of the portal vein and perfusion of the inferior vena cava with at least 20 ml cold PBS. Lymphocytes were isolated by density gradient centrifugation using a 37.5% Percoll solution. RBCs were lysed using ACK lysis buffer (eBioscience). Fc receptors were blocked with an anti-CD16/CD32 (2.4G2) Ab (BD Biosciences). Invitrogen fixable Aqua Live/Dead stain was used according to the manufacturer’s instructions for dead cell exclusion. Surface markers were stained using NK1.1 (PK136), CD3ε (145-2C11), CD11b (M1/70), Ly49A (A1), Ly49G2 (4D11), Ly49I (YLI90), Ly49F (HBF-719), NKG2D (CX5), NKp46 (29A1.4), CD244.2 (2B4), Ly49D (4E5), Ly49H (3D10), CD27 (LG.3A10), NKG2AB6 (16a11), CD49a (Ha31/8), CD94 (18D3), DNAM-1 (10E5), killer cell lectin-like receptor G1 (KLRG1; 2F1), CD90 (30-H12), anti–phosphatidylinositol-3,4,5-trisphosphate [PI(3,4,5)P3] IgM (Echelon, Logan, Utah), pS2448 mammalian target of rapamycin (mTOR; O21-404), and pS473 Akt (M89-61). All Abs were purchased from BD Biosciences, BioLegend, eBioscience, or from R&D Systems (Minneapolis, MN). Ly49C (4LO3311) staining was performed using supernatant purchased from University of California San Franscisco and revealed using an allophycocyanin-AffiniPure goat anti-mouse IgG, Fcγ subclass 3–specific secondary Ab purchased from Jackson ImmunoResearch Laboratories (West Grove, PA). Fixation and permeabilization were performed using the BD Biosciences Cytofix/Cytoperm kit, and cells were analyzed using a BD LSRFortessa cell analyzer (BD Biosciences). In all cases flow cytometry plots are shown after backgating for singlets, viable cells, and, when applicable, lymphocytes. As described by O’Leary et al. (8), shaved abdominal skin of NKp46iCre/+SHIP1flox/flox mice and SHIP1flox/flox controls was primed by painting with 50 μl 5% oxazolone dissolved in 1:1 methanol/acetone on days 0 and 1. One month later, baseline ear thickness was measured using a micrometer on the first cartilage ridge. One ear was painted with solvent only to account for any acute solvent-induced swelling, and the other was painted with 20 μl 1% oxazolone. Twenty-four hours later, the thickness of both ears was measured. To account for acute hapten-induced ear swelling, ears of naive mice were painted and subsequent swelling was measured at 24 h. Ear swelling was calculated as follows: (thickness of hapten-challenged ear at 24 h − thickness of hapten-challenged ear at baseline) − (thickness of solvent-challenged ear at 24 h − thickness of solvent-challenged ear at baseline) − (thickness of nonprimed mouse ear at 24 h − thickness of nonprimed mouse ear at baseline). All statistical analyses were performed using the statistical software Prism (GraphPad Software, San Diego, CA). The p values < 0.05 were considered statistically significant (*p < 0.05, **p < 0.01, and ***p < 0.001). To determine whether defective NK cell behavior observed in mice with germline SHIP1 deficiency is due to an NK cell–intrinsic requirement for SHIP1 expression rather than due to the general inflammatory milieu present in these mice, we created an NK conditional deletion of SHIP1. To do this, we used NKp46-iCre mice (mice with an improved Cre recombinase transgene in the NKp46 locus) on a SHIP1flox/flox C57BL/6 background (15) to specifically delete SHIP1 in NK cells. NKp46-iCre mice have been described previously (34) and were shown to have NK cells that develop normally in all tissues, express a normal NKRR, produce cytokines normally, and kill target cells as efficiently as do wild-type (WT) NK cells. We did not observe any decrease in longevity or gross pathology in NKp46iCre/+SHIP1flox/flox mice. This differs dramatically from germline SHIP1−/− mice that succumb to pneumonia and/or Crohn’s-like disease by 6–10 wk of life (21, 22, 27). To confirm that SHIP1 is deleted specifically in NK cells, we performed intracellular flow cytometry for SHIP1 and found that both T and B cells from NKp46iCre/+SHIP1flox/flox mice express normal levels of SHIP1 and that SHIP1 deficiency is indeed confined to NK cells (Fig. 1). NKp46iCre/+SHIP1flox/flox mice do not express SHIP1 selectively in NK cells. Splenocytes harvested from NKp46iCre/+SHIP1flox/flox mice (black histogram) and SHIP1flox/flox controls (gray histogram) were stained with anti-NK1.1, anti-CD3ε, and anti-CD19 Abs and, following fixation and permeabilization, were stained with either anti-SHIP1 Ab or isotype control (filled histogram) showing deletion of SHIP1 in (A) NK1.1+CD3ε−CD19− viable NK cells but not in (B) CD19+CD3ε−NK1.1− viable B cells or in (C) CD3ε+NK1.1−CD19− viable T cells. These flow cytometry plots are representative of at least three NKp46iCre/+SHIP1flox/flox mice and three SHIP1flox/flox controls with similar results. To begin to analyze the effects of SHIP1 deficiency on NK cells, we harvested splenocytes from NKp46iCre/+SHIP1flox/flox mice and SHIP1flox/flox controls and performed flow cytometry to determine whether SHIP1 is required for normal NK cell development and homeostasis. As shown in Fig. 2A and 2B, NKp46iCre/+SHIP1flox/flox mice have a modest but significantly decreased frequency and absolute number of splenic NK cells, indicating that SHIP1 is intrinsically required for regulation of NK cell frequency. Furthermore, terminal maturation of NK cells is also dependent on SHIP1 expression. Terminal maturation of peripheral NK cells is determined by coordinate analysis of CD27 and CD11b surface expression (35). Immature NK cells are CD27+CD11b− (referred to in this study as R1), whereas NK cell maturity is demarcated by loss of CD27 expression and acquisition of CD11b expression (CD27−CD11b+ cells; R3). NK cells pass through an intermediate stage (R2) where they express both CD27 and CD11b. Again, NKp46iCre/+SHIP1flox/flox mice have a modest but significantly decreased frequency of mature CD27−CD11b+ splenic NK cells and significantly increased numbers of CD27+CD11b− splenic NK cells (Fig. 2C, 2D), indicating an NK cell–intrinsic role for SHIP1 in promoting efficient NK cell maturation in the periphery. NK cell expression of SHIP1 is required for NK cell development. (A and B) Splenocytes harvested from NKp46iCre/+SHIP1flox/flox mice and SHIP1flox/flox controls were stained with anti-NK1.1 and anti-CD3ε to determine (A) frequency of NK1.1+CD3ε− viable NK cells among splenic lymphocytes and (B) absolute number of splenic NK cells. NK cell terminal maturation was assessed by coordinate analysis of anti-CD27 and anti-CD11b staining. Graphs summarize pooled data from at least four independent experiments including at least three NKp46iCre/+SHIP1flox/flox mice and three SHIP1flox/flox controls in each experiment. One representative flow plot showing CD27 versus CD11b staining from an NKp46iCre/+SHIP1flox/flox mouse and a SHIP1flox/flox control is shown (C) on gated singlet, viable, lymphocyte, NK1.1+CD3ε− populations. (D) Box-and-whisker plots indicating percentage of CD27+CD11b− (R1), CD27+CD11b+ (R2), and CD27−CD11b+ (R3) NK cell populations summarize data from at least three NKp46iCre/+SHIP1flox/flox mice and 3 SHIP1flox/flox controls and has been repeated in at least two other independent experiments. *p < 0.05, ***p < 0.001. We next hypothesized that SHIP1 is required for normal NKRR expression as was first reported in germline SHIP−/− mice (15). To test this hypothesis, we implemented a multicolor flow cytometry panel to determine the frequency of NK cells expressing a multitude of different NK cell receptors. We found a normal frequency of NK cells expressing most activating receptors analyzed, including Ly49D, Ly49H, NKp46, NKG2D, and CD94 and the SLAM family receptor 2B4 (Fig. 3A), most of which are dramatically reduced in germline SHIP−/− mice (15, 16). This attests to the power of conditional mutation analysis and indicates that SHIP1 may have a role in trans in regulation of the NKRR. We used Boolean gating to fully characterize inhibitory Ly49 receptor expression among 32 different NK cell subsets in a similar manner to that of Brodin et al. (36). Using this technique, we found significantly increased frequency of NK cells expressing the MHC class I (MHC-I)–binding inhibitory receptors Ly49A, Ly49F, Ly49G2, and Ly49C and significantly decreased frequency of NK cells expressing Ly49I (Fig. 3B). 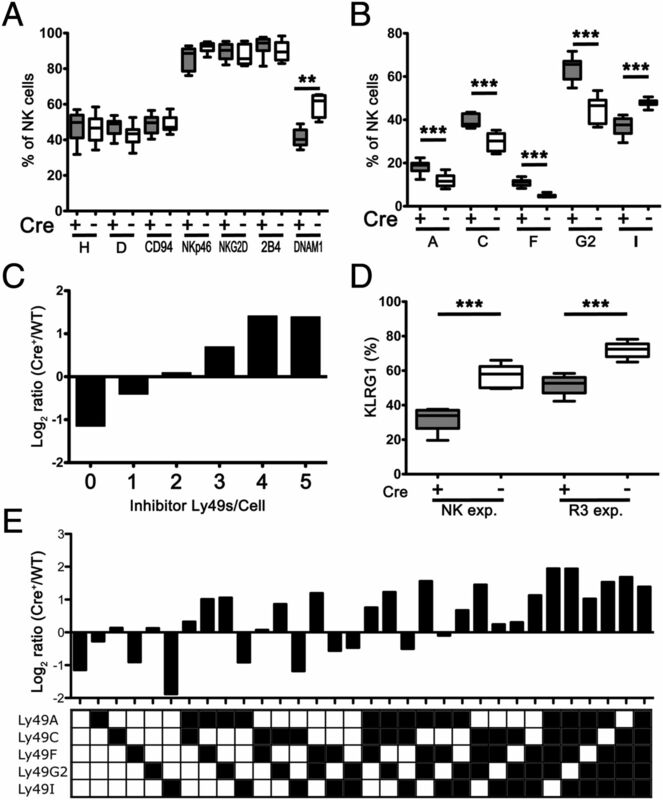 Interestingly, we observed an increase in the number of Ly49 inhibitory receptors expressed per NK cell and a decreased frequency of NK cells that either do not express an inhibitory Ly49 receptor or express only a single Ly49 receptor (Fig. 3C, 3E), which is very similar to the repertoire disruption observed in β2 microglobulin (β2m)−/− mice that have an improperly educated NK compartment owing to greatly diminished surface expression of MHC-I (37, 38). NK cell expression of SHIP1 is required for normal NKRR expression. (A) Splenocytes harvested from NKp46iCre/+SHIP1flox/flox mice and SHIP1flox/flox controls were stained with anti-Ly49H, anti-Ly49D, anti-CD94, anti-NKp46, anti-NKG2D, anti-2B4, and anti-DNAM-1 or (B) anti-Ly49A, anti-Ly49C, anti-Ly49F, anti-Ly49G2, and anti-Ly49I Abs and analyzed by flow cytometry. All cells were also stained with anti-NK1.1, anti-CD3ε, and a viability dye, and the frequency of NK cells expressing the given receptor was determined after backgating for singlets, live cells, lymphocytes, and NK1.1+CD3ε− NK cells. (C) Boolean gating was used to determine the number of inhibitory, MHC-I–binding Ly49 receptors expressed by each NK cell harvested from NKp46iCre/+SHIP1flox/flox mice and SHIP1flox/flox controls. The results are expressed as the log2 ratio between these frequencies. (D) Splenocytes harvested from NKp46iCre/+SHIP1flox/flox mice and SHIP1flox/flox controls were stained with anti-NK1.1, anti-CD3ε, anti-CD27, anti-CD11b, and anti-KLRG1 Abs and analyzed by flow cytometry. KLRG1 expression is shown among NK1.1+CD3ε− NK cells as well as among R3 (NK1.1+CD3ε−CD27−CD11b+) mature NK cells. (E) The frequencies of 32 subsets of NK cells expressing different combinations of inhibitory Ly49 receptors (expression is indicated by a filled box) was determined using Boolean gating scheme in both NKp46iCre/+SHIP1flox/flox mice and SHIP1flox/flox controls. The results are expressed as the log2 ratio between these frequencies. The graphs represent pooled data from at least seven NKp46iCre/+SHIP1flox/flox mice and seven SHIP1flox/flox controls collected in at least two independent experiments. **p < 0.01, ***p < 0.001. Importantly, surface KLRG1 expression is significantly decreased in NKp46iCre/+SHIP1flox/flox mice compared with SHIP1flox/flox controls (Fig. 3D). KLRG1 is an NK cell inhibitory receptor capable of binding cadherin molecules (E, N, R) (39) and is preferentially expressed on mature NK cells (34). The decrease in KLRG1 expression is not simply due to decreased CD11b+CD27− mature NK cells in our mice, as when KLRG1 expression is analyzed after backgating on the most mature (R3) NK cell population, KLRG1 expression remains decreased (Fig. 3D). KLRG1 expression is significantly increased on NK cells following infection (40) whereas KLRG1 expression is significantly decreased on NK cells from β2m−/− mice (37, 41) and from C57BL/6 mice with KbDb deficiency (42), and thus its expression is thought to demarcate educated NK cells (3). Thus, decreased DNAM-1 and KLRG1 surface expression and the increased frequency of NK cells expressing multiple inhibitory Ly49 receptors indicate that an uneducated NK cell compartment is present in NKp46iCre/+SHIP1flox/flox mice. We next wanted to determine whether SHIP1 is required for regulation of signaling pathways important for NK cell activation. Given that SHIP1 catalyzes the hydrolysis of PI(3,4,5)P3 to phosphatidylinositol-3,4-bisphosphate and thus functions as a negative regulator of the PI3K pathway, we hypothesized that NK cells from NKp46iCre/+SHIP1flox/flox would have increased activation of several different signaling pathways. 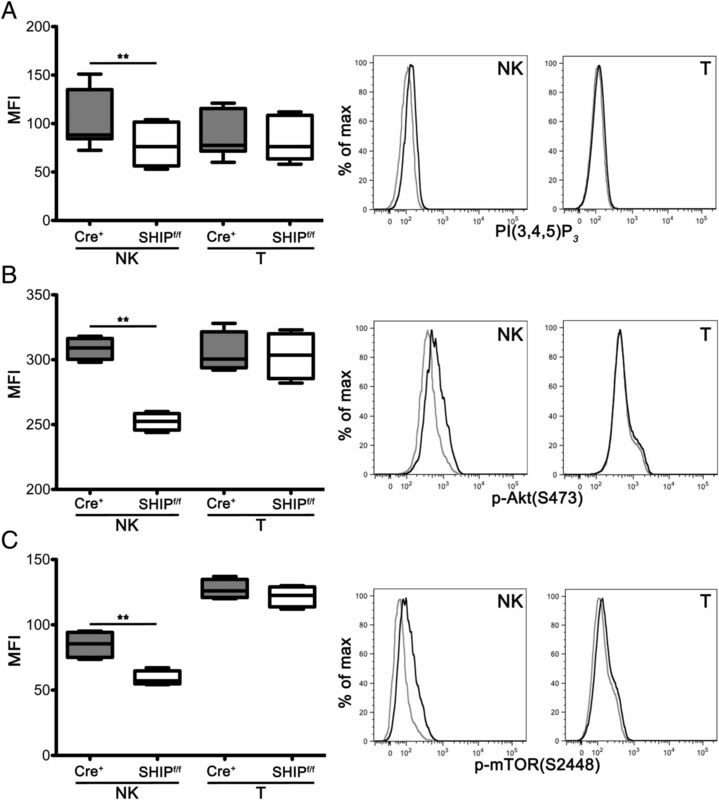 We found using intracellular flow cytometry that NK cells, but not T cells, from NKp46iCre/+SHIP1flox/flox mice had significantly increased levels of PI(3,4,5)P3, phosphorylated Akt (p-Akt S473), and phosphorylated mTOR (p-mTOR S2448) (Fig. 4). The Akt/mTOR signaling pathway promotes NK cell activation and survival. Thus, the intracellular signaling profile of NKp46iCre/+SHIP1flox/flox NK cells is consistent with a state of sustained activation even during normal homeostasis. SHIP1-deficient NK cells have increased phosphorylation of activating signaling pathways. Splenocytes harvested from NKp46iCre/+SHIP1flox/flox mice (black histograms) and SHIP1flox/flox controls (gray histograms) were stained with anti-NK1.1, anti-CD3ε, and a viability dye. Following fixation and permeabilization cells were stained with (A) anti-PI(3,4,5)P3, (B) anti-pS473 Akt, and (C) anti-pS2448 mTOR Abs and analyzed by flow cytometry. Graphs are expressed as the median fluorescence intensity (MFI) (A–C) after backgating on singlets, live cells, lymphocytes, and either NK1.1+CD3ε− NK cells or NK1.1−CD3ε+ T cells. Graphs summarize data from four NKp46iCre/+SHIP1flox/flox mice and 4 SHIP1flox/flox controls, and similar data was gathered in at least two independent experiments. **p < 0.01. Owing to the sustained activation state of NK cells in healthy, unmanipulated NKp46iCre/+SHIP1flox/flox mice, we hypothesized that they might adopt a hyporesponsive or disarmed state, consistent with findings in mouse models where NK cells are chronically stimulated (6, 37, 43). To assess this possibility, we measured IFN-γ production from NK cells via intracellular flow cytometry following activation of NK cells using plate-bound Abs to crosslink NK1.1, NKp46, or NKG2D, representing three major NK-activating receptors for cell-surface ligands. In each case, significantly fewer NK cells from NKp46iCre/+SHIP1flox/flox mice were able to produce IFN-γ after activation compared with SHIP1flox/flox controls (Fig. 5A, 5B). However, we did not observe a significant impairment for NKp46iCre/+SHIP1flox/flox NK cells stimulated with PMA and ionomycin, indicating that SHIP1 deficiency in NK cells does not result in a distal signaling defect that impairs IFN-γ production. NKG2D and NK1.1 surface expression are not significantly different between NKp46iCre/+SHIP1flox/flox and SHIP1flox/flox controls, and although NKp46 surface expression is decreased in NKp46iCre/+ mice (Fig. 5C), NKp46iCre/+ NK cells produce IFN-γ comparable to NKp46+/+ NK cells after ex vivo activation with an anti-NKp46 Ab (34). Thus, despite the normal representation in the SHIP1-deficient NK compartment and normal surface expression of NKG2D and NK1.1, crosslinking of three independent activating receptors results in defective activation of a key NK effector function. SHIP1 is required for IFN-γ production. (A) Splenocytes harvested from NKp46iCre/+SHIP1flox/flox mice and SHIP1flox/flox controls were incubated on uncoated plates, plates coated with anti-NK1.1, anti-NKp46, or anti-NKG2D Ab, or on uncoated plates but stimulated with PMA and ionomycin. The frequency of IFN-γ production among NK1.1+CD3ε− (for all samples not stimulated with anti-NK1.1 Ab) or NKp46+CD3ε− (for samples stimulated with anti-NK1.1 Ab) was determined using flow cytometry with representative flow plots shown. (B) The graph summarizes pooled data from at least data from eight NKp46iCre/+SHIP1flox/flox mice and eight SHIP1flox/flox controls gathered in at least two independent experiments. (C) Splenocytes were stained with anti-NK1.1, anti-CD3ε, anti-NKp46, and anti-NKG2D Abs. Surface expression of the indicated activating receptor was determined after backgating on singlets, viable lymphocytes, and NK1.1+CD3ε− NK cells. *p < 0.05, ***p < 0.001. To further test the functional competency of the NK cell compartment in NKp46iCre/+SHIP1flox/flox mice, we asked whether these mice could efficiently reject an MHC-I–mismatched BM allograft. This assay provides an in vivo measure of NK cytolytic function, and importantly it also allows us to determine whether SHIP1 expression is an intrinsic requirement for proper NK cell effector function in vivo, a question that cannot be addressed using chimeras consisting of WT and mutant BM. In this assay, we transplanted equal numbers of congenic C57BL/6 SJL (CD45.1, H2b; cells that should not be rejected) and MHC-I–mismatched BALB/C (H2d; cells that are rejected by normal, healthy mice) BM cells into lethally irradiated NKp46iCre/+SHIP1flox/flox mice and SHIP1flox/flox controls. One week after transplantation, flow cytometric analysis of peripheral blood samples showed a significantly decreased frequency of MHC-I–mismatched (H2d) donor cells in SHIP1flox/flox control mice as compared with mice with SHIP1-deficient NK cells (Fig. 6). Thus, NK lineage expression of SHIP1 is required for acute rejection of an MHC-I unmatched BM graft. SHIP1 is required for NK-mediated acute BM graft rejection. Lethally irradiated NKp46iCre/+SHIP1flox/flox mice and SHIP1flox/flox controls received 2 million BL/6.SJL (CD45.1 congenic MHC-H2b) and 2 million BALB/C (H2d) BM cells. (A) Flow cytometry performed after 1 wk on peripheral blood samples comparing the frequency of viable MHC-H2Dd+ cells versus CD45.1+ MHC-I–matched BM cells. (B) The ratio of MHC-H2d+ cells compared with CD45.1+ cells is indicated in the graph, which summarizes data from four NKp46iCre/+SHIP1flox/flox mice and four SHIP1flox/flox controls and is representative of two independent experiments. “Acute rejection” is calculated by the frequency of allogenic cells (H2Dd+) divided by the frequency of congenic cells (CD45.1+). ***p < 0.001. NK cells are capable of a mounting a memory response to certain viruses (7), viral particles (9), and haptens (8). The NK cells responsible for memory response to hapten (contact hypersensitivity) are located in the liver, express Thy-1, require CXCR6 signaling, and are DX5− but are CD49a+ and express either Ly49C or Ly49I (8–10). As noted above, NKp46iCre/+SHIP1flox/flox mice do have a modest, but significant, reduction in NK1.1+CD3ε− NK cell numbers. Importantly, whereas NKp46iCre/+SHIP1flox/flox mice do have a significantly decreased frequency of NK1.1+CD3ε− hepatic NK cells (Fig. 7A), these mice do not have a significant decrease in hepatic memory NK cell frequency (NK1.1+CD3ε−DX5−CD49a+Thy1.2+Ly49C/I+) compared with SHIP1flox/flox controls (Fig. 7B) or absolute numbers of hepatic memory NK cell numbers (Fig. 7C). Therefore, if these mice are unable to mount a memory response to hapten, any functional deficit cannot be attributed to decreased memory NK cell frequency but a requirement for SHIP1. Of note, DX5−NKp46+CD3ε− liver cells are now recognized as ILC1 (44, 45). To determine whether SHIP1 is required for NK memory responses to hapten, we primed NKp46iCre/+SHIP1flox/flox mice and SHIP1flox/flox controls by painting shaved abdominal skin with oxazolone. One month later, NKp46iCre/+SHIP1flox/flox mice had significantly less ear swelling after challenge with oxazolone as compared with SHIPflox/flox controls (Fig. 7D), indicating that NK-intrinsic expression of SHIP1 is required for a robust NK memory response that can elicit hapten-induced contact hypersensitivity. SHIP1 is required for memory response to hapten-induced delayed type contact hypersensitivity. Mice were sacrificed via CO2 toxicity and livers were rapidly perfused with cold PBS to remove PBLs prior to liver resection. Lymphocytes were isolated from liver samples from NKp46iCre/+SHIP1flox/flox mice and SHIP1flox/flox controls via Percoll density gradient centrifugation. Lymphocytes were stained with anti-NK1.1, anti-CD3ε, anti-Thy1.2, anti-DX5, anti-CD49a, anti-Ly49C (4LO3311 mAb), and anti-Ly49I (YLI-90 mAb) Abs to determine memory NK cell frequency. (A) NK1.1+CD3ε− hepatic NK cell and (B) NK1.1+CD3ε−Thy1.2+DX5−CD49a+Ly49C/I+ memory NK cell frequency among hepatic lymphocytes was determined with DAPI staining used for dead cell exclusion. Absolute NK1.1+CD3ε−Thy1.2+DX5−CD49a+Ly49C/I+ memory NK cell numbers are given in (C). The graphs summarize pooled data from seven NKp46iCre/+SHIP1flox/flox mice and eight SHIP1flox/flox controls gathered during two independent experiments. (D) Shaved abdominal skin of NKp46iCre/+SHIP1flox/flox mice and SHIP1flox/flox controls was primed by painting with oxazolone. Thirty days later one ear was challenged with solvent while the other with oxazolone. Twenty-four hours following oxazolone challenged ear swelling was measured while accounting for acute swelling due to solvent-induced irritation (see further details in the Materials and Methods). The graph represents pooled data from two independent experiments of at least five NKp46iCre/+SHIP1flox/flox mice and five SHIP1flox/flox controls. *p < 0.05, **p < 0.01. In this study, we developed a mouse model with NK cell–specific deletion of SHIP1 to determine its role in NK cell development, education, and effector function. We show that NK cell–intrinsic expression of SHIP1 is required for NK cell homeostasis, development, and receptor repertoire formation. Additionally, we have shown that SHIP1 is required for NK cell activation and education, thus providing a molecular signaling component required for these key NK cell milestones. Previous studies examining the role of SHIP1 in NK cells have been performed using mice with germline deficiency in SHIP1. These studies have shown that mice require SHIP1 for normal NK cell homeostasis, normal IFN-γ production, and for rejection of a mismatched MHC-I BM allograft. Mice with germline deficiency of SHIP1 were shown to have increased numbers of NK cells (15), and BM chimeras made from WT and SHIP1 germline-deficient BM have normal numbers of NK cells (46), and thus there is a role for SHIP1 in trans in limiting NK cell numbers, but NK cell–intrinsic expression of SHIP1 is in fact required for normal NK cell homeostasis, as our mice have a slight decrease in splenic NK cell frequency. SHIP1 has also been shown to regulate NKRR expression. Mice with germline SHIP1 deficiency on a mixed 129/C57BL/6 genetic background were originally shown to have increased frequencies of Ly49A, Ly49C, and Ly49C/I (using the 5E6 mAb)-expressing NK cells and decreased frequencies of NK cells expressing Ly49G2, CD94, and Ly49D (15). Germline SHIP1−/− NK cells on a BL/6 background were later shown to express nearly all receptors analyzed at a decreased frequency, including inhibitory receptors capable of binding MHC-I molecules Ly49A, Ly49C/I, Ly49F, Ly49G2, Ly49I, activating receptors capable of binding MHC-I molecules including Ly49D, and other activating receptors such as NKG2D, Ly49H, and NKp46 (16). In the present study we show that, with the exception of DNAM-1, NK cell expression of SHIP1 is dispensable for regulation of expression of activation receptors and of inhibitory receptors that bind nonclassical MHC-I molecules. However, we show in the present study that SHIP1 is required to limit frequencies of most inhibitory MHC-I–binding Ly49 receptors (all except Ly49I), and we observed increased numbers of NK cells expressing multiple Ly49 inhibitory receptors, including NK cell subsets expressing 3–5 such receptors. This pattern of receptor expression is also seen in mice with β2m deficiency. 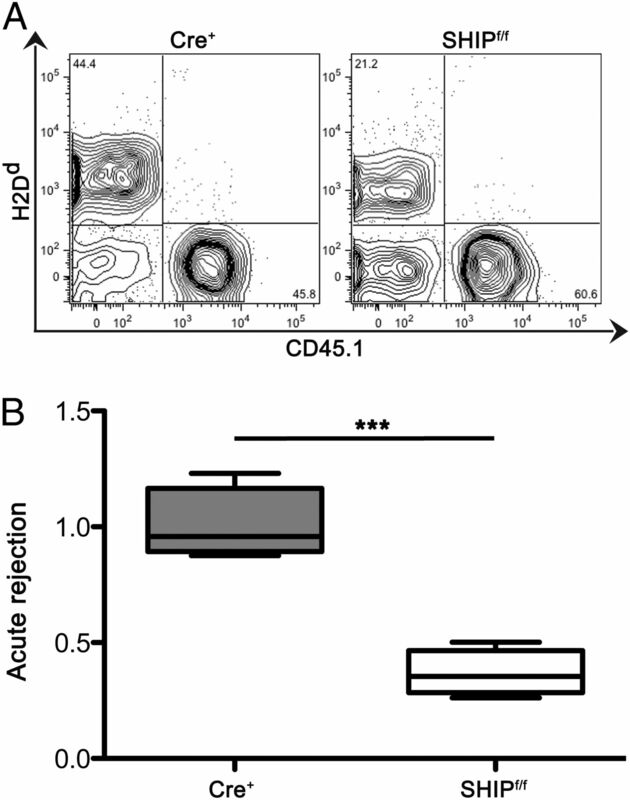 β2m is required for stable surface expression of MHC-I molecules, and thus mice with β2m deficiency do not have educated NK cells because there is no ligand for Ly49 binding. Thus, this pattern of Ly49 expression indicates that SHIP1 is required for NK cell education. A liver-resident subset of NK cells was recently shown to mediate delayed type contact hypersensitivity in an Ag-specific manner (8). Specific signaling molecules required by these cells have only begun to be elucidated. Initial Ag-specific proliferation to mCMV requires the transcription factor zbtb32 (11), and NK cell memory to mCMV requires STAT4 signaling and DNAM-1 (12, 13), but signaling molecules and events required for NK cell memory to haptens have not been identified. This study reveals SHIP1 to be a critical signaling component required for NK cell memory to hapten. NK cells have recently been shown to possess the capacity to form memory to the mouse herpes virus mCMV (7). Formation of this type of NK cell memory could be a distinct molecular process, and thus it is presently unclear whether SHIP1 is required for formation of the NK cell memory response to mCMV. Previous studies have indicated at least two different cellular mechanisms for NK cell education. First, NK cells must undergo an “arming” process where an inhibitory receptor expressed by the NK cell must bind to host MHC-I molecules to become functionally competent (3). Second, NK cells experiencing chronic activation are “disarmed” or rendered hyporesponsive (37). Several studies have shown that disarming appears to act as the dominant NK cell education process (43, 47). We have shown that in the absence of SHIP1, NK cells have increased activation of the PI3K/Akt/mTOR axis. However, despite the increased activation of pathways important to NK cell activation and memory formation, NKp46iCre/+SHIP1flox/flox NK cells have defective effector functions, indicating that chronic stimulation results in hyporesponsive NK cells similar to the disarmed NK cells from transgenic mice with constitutive expression of an activating ligand (6, 48). Recently, Viant et al. (49) described mice with NK cell conditional deletion of the tyrosine phosphatase SHP-1. Following ligation of an NK cell inhibitor receptor, SHP-1 is recruited to the ITIM of that receptor (50) and attenuates NK cell activation (49). NK cells from NCR1iCre/+SHP-1flox/flox mice have a very similar phenotype to NCR1iCre/+SHIPflox/flox NK cells. Both types of mice have increased frequency of inhibitory Ly49 expression by NK cells but do not have alteration in frequency or expression of the activating receptors Ly49D, Ly49H, or NKG2D. Additionally, SHP-1 was shown to be required for NK cell terminal maturation in the periphery, and NK cells from NCR1iCre/+SHP-1flox/flox mice were hyporesponsive both in vitro and in vivo. 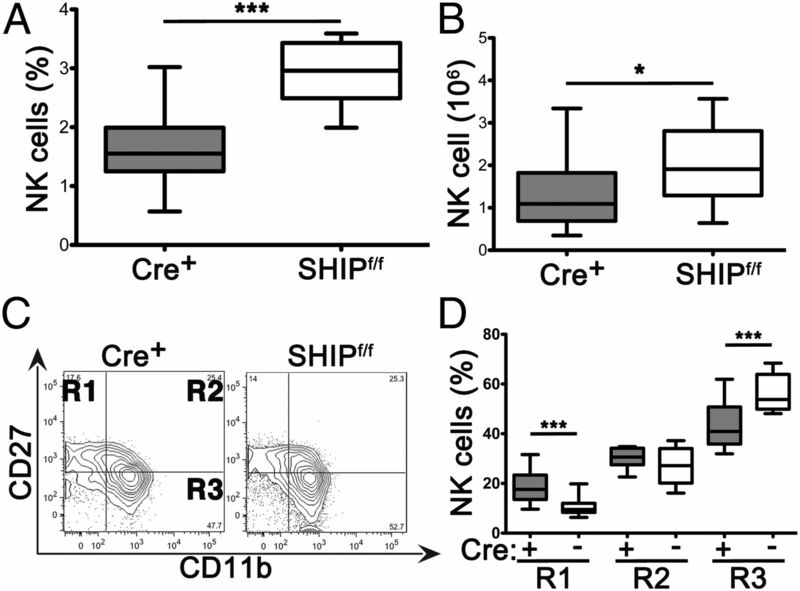 Unlike SHIP1-deficient NK cells, SHP-1–deficient NK cells do not have increased activation of kinases such as Akt and mTOR but instead are unable to attenuate NK activation after ligation of an inhibitory receptor. Thus, NK cell deficiency of two different phosphatases, SHP-1, which is needed for inhibitory receptor signaling, and SHIP1, which is needed to attenuate basal signaling from activating receptors during normal homeostasis, both result in hyporesponsiveness due to chronic activation. It is possible that the in vivo functional defects reported above in NKp46iCre/+SHIP1flox/flox mice are attributable to the modest reductions we observe in splenic NK cell frequency or frequency of CD11b+CD27− mature NK cells. We think this to be unlikely, as the maturation and NK cell homeostasis defects are slight and thus are not sufficient to compromise the NK compartment as a whole. Furthermore, NKp46iCre/+SHIP1flox/flox NK cells were hyporeactive in vitro, favoring NK cell hyporeactivity as the explanation for in vivo functional defects we elucidate in the present study. Thus, these findings show that SHIP1 is a key signaling component elaborated by NK cells that is critical to prevent inappropriately high basal signaling and thus chronic activation of NK cells and their disarming. E.V. is the cofounder and a shareholder of Innate Pharma. The remaining authors have no financial conflicts of interest. We thank Lewis Lanier and Robert Brooks for critical reading and constructive suggestions on this manuscript. This work was supported by National Institutes of Health Grants R01 HL072523, R01 HL085580, and R01 HL107127, as well as by grants from the Paige Arnold Butterfly Run and the Carol Baldwin Foundation. W.G.K. is the Murphy Family Professor of Children's Oncology Research, a State University of New York Empire Scholar, and a Senior Scholar of the Crohn's & Colitis Foundation of America. E.V. is supported by the European Research Council (The Immune Function of Natural Killer Cells Advanced Grant), by the Ligue Nationale contre le Cancer (Equipe Labellisée), and by institutional grants from INSERM, Centre National de la Recherche Scientifique, and Aix-Marseille University to Centre d'Immunologie de Marseille-Luminy. E.V. is a scholar of the Institut Universitaire de France.
. 2010. Current perspectives of natural killer cell education by MHC class I molecules. Nat. Rev. Immunol. 10: 724–734.
. 2006. Self-tolerance of natural killer cells. Nat. Rev. Immunol. 6: 520–531.
. 2008. Continuous engagement of a self-specific activation receptor induces NK cell tolerance. J. Exp. Med. 205: 1829–1841.
. 2014. The transcription factor Zbtb32 controls the proliferative burst of virus-specific natural killer cells responding to infection. Nat. Immunol. 15: 546–553.
. 2014. Costimulatory molecule DNAM-1 is essential for optimal differentiation of memory natural killer cells during mouse cytomegalovirus infection. Immunity 40: 225–234.
. 2013. Role of inositol phospholipid signaling in natural killer cell biology. Front. Immunol. 4: 47.
. 2002. Influence of SHIP on the NK repertoire and allogeneic bone marrow transplantation. Science 295: 2094–2097.
. 2010. SHIP influences signals from CD48 and MHC class I ligands that regulate NK cell homeostasis, effector function, and repertoire formation. J. Immunol. 184: 5065–5074.
. 2007. Inappropriate recruitment and activity by the Src homology region 2 domain-containing phosphatase 1 (SHP1) is responsible for receptor dominance in the SHIP-deficient NK cell. J. Immunol. 179: 8009–8015.
. 2006. Cutting edge: dominance by an MHC-independent inhibitory receptor compromises NK killing of complex targets. J. Immunol. 176: 7165–7169.
. 2005. Src homology 2-containing inositol 5′-phosphatase 1 negatively regulates IFN-γ production by natural killer cells stimulated with antibody-coated tumor cells and interleukin-12. Cancer Res. 65: 9099–9107.
. 2002. SH2-containing inositol phosphatase (SHIP-1) transiently translocates to raft domains and modulates CD16-mediated cytotoxicity in human NK cells. Blood 100: 4581–4589.
. 1998. Targeted disruption of SHIP leads to hemopoietic perturbations, lung pathology, and a shortened life span. Genes Dev. 12: 1610–1620.
. 2011. SHIP deficiency causes Crohn's disease-like ileitis. Gut 60: 177–188.
. 2007. T cell-specific deletion of the inositol phosphatase SHIP reveals its role in regulating Th1/Th2 and cytotoxic responses. Proc. Natl. Acad. Sci. USA 104: 11382–11387.
. 2014. Impaired T-cell survival promotes mucosal inflammatory disease in SHIP1-deficient mice. Muc. Immunol. 7: 1429–1439.
. 1998. The inositol polyphosphate 5-phosphatase ship is a crucial negative regulator of B cell antigen receptor signaling. J. Exp. Med. 188: 1333–1342.
. 2009. SHIP limits immunoregulatory capacity in the T-cell compartment. Blood 113: 2934–2944.
. 2004. Expansion of myeloid suppressor cells in SHIP-deficient mice represses allogeneic T cell responses. J. Immunol. 173: 7324–7330.
. 2007. Induced SHIP deficiency expands myeloid regulatory cells and abrogates graft-versus-host disease. J. Immunol. 178: 2893–2900.
. 2008. SH2-inositol phosphatase 1 negatively influences early megakaryocyte progenitors. PLoS ONE 3: e3565.
. 2004. The role of SHIP1 in macrophage programming and activation. Biochem. Soc. Trans. 32: 785–788.
. 2011. SHIP represses Th2 skewing by inhibiting IL-4 production from basophils. J. Immunol. 186: 323–332.
. 2009. SHIP is required for a functional hematopoietic stem cell niche. Blood 113: 2924–2933.
. 2014. SHIP1 regulates MSC numbers and their osteolineage commitment by limiting induction of the PI3K/Akt/β-catenin/Id2 axis. Stem Cells Dev. 23: 2336–2351.
. 2011. Fate mapping analysis of lymphoid cells expressing the NKp46 cell surface receptor. Proc. Natl. Acad. Sci. USA 108: 18324–18329.
. 2006. CD27 dissects mature NK cells into two subsets with distinct responsiveness and migratory capacity. J. Immunol. 176: 1517–1524.
. 2012. Skewing of the NK cell repertoire by MHC class I via quantitatively controlled enrichment and contraction of specific Ly49 subsets. J. Immunol. 188: 2218–2226.
. 2005. A subset of natural killer cells achieves self-tolerance without expressing inhibitory receptors specific for self-MHC molecules. Blood 105: 4416–4423.
. 1997. Altered expression of Ly49 inhibitory receptors on natural killer cells from MHC class I-deficient mice. J. Immunol. 158: 3174–3180.
. 2006. Killer cell lectin-like receptor G1 binds three members of the classical cadherin family to inhibit NK cell cytotoxicity. J. Exp. Med. 203: 289–295.
. 2002. Cutting edge: inhibitory functions of the killer cell lectin-like receptor G1 molecule during the activation of mouse NK cells. J. Immunol. 168: 2585–2589.
. 2000. NK cell expression of the killer cell lectin-like receptor G1 (KLRG1), the mouse homolog of MAFA, is modulated by MHC class I molecules. Eur. J. Immunol. 30: 920–930.
. 2011. Confinement of activating receptors at the plasma membrane controls natural killer cell tolerance. Sci. Signal. 4: ra21.
. 1997. Natural killer cell tolerance in mice with mosaic expression of major histocompatibility complex class I transgene. J. Exp. Med. 186: 353–364.
. 2014. Development, differentiation, and diversity of innate lymphoid cells. Immunity 41: 354–365.
. 2014. The brave new world of innate lymphoid cells. Nat. Immunol. 16: 1–5.
. 2012. Mouse natural killer cell development and maturation are differentially regulated by SHIP-1. Blood 120: 4583–4590.
. 1997. Class I-deficient hemopoietic cells and nonhemopoietic cells dominantly induce unresponsiveness of natural killer cells to class I-deficient bone marrow cell grafts. J. Immunol. 158: 1628–1633.
. 2008. Tolerance of NK cells encountering their viral ligand during development. J. Exp. Med. 205: 1819–1828.
. 2014. SHP-1-mediated inhibitory signals promote responsiveness and anti-tumour functions of natural killer cells. Nat. Commun. 5: 5108.
. 2008. Immunoreceptor tyrosine-based inhibition motifs: a quest in the past and future. Immunol. Rev. 224: 11–43.